Spain progress from the group stage of the Confederations Cup with a perfect record of three wins from three games with this victory in Fortaleza. If the Spanish press were particularly enthusiastic after the opening game against Uruguay, their reaction to a sluggish, lethargic performance against Nigeria, despite the final scoreline flattering La Roja, would be interesting to say the least. Spain opened brightly before falling away quite sharply. With greater quality in the final third, Nigeria could have asked some serious questions of the Spanish. Spain coach del Bosque made changes to his starting line up yet against after the heavy defeat of Tahiti. Only Sergio Ramos remained which meant the Real Madrid defender has started all three games. The remainder of the team that had defeated Uruguay returned with the one exception being Valdes replacing Casillas in goal. Nigerian coach Stephen Keshi named his strongest available line up for a game that Nigeria had to win following their narrow defeat to Uruguay. An unusual occurrence at the final whistle of this game arrived in the shape of a scoreline which, on the balance of the quality of chances created, probably flattered Spain. La Roja started brightly and Iniesta had a shot well saved in the opening minute with Alba providing a supporting run. An early warning sign that was repeated just two minutes later when the marauding left back opening the scoring. Whilst his run was superb, the Nigerian defence should have dealt with him as he cut in centrally but any attempts to tackle him were poor at best. This should not deflect from the crucial moment in the development of the goal. The movement and positioning of Fabregas, Iniesta and Pedro. Fabregas instigates the move when he plays a forward pass from a deep position enabling Iniesta and Pedro to combine. Both Barcelona players are very central, with Pedro completely vacating his right wing berth to link up. The movement of all three players helps create the chance which Alba converts. And this set the tone for the opening 15 minutes. Spain pressed high up the pitch and recovered their position quickly against a Nigerian team that didn’t really counter that quickly. Then, Spain began to fade. The pressing dropped off and their general play lessened. Nigeria were able to build moves. Valdes was pressed at every opportunity and forced to kick long. Nigeria created some half chances from cross balls but the required quality at the final moment was missing from their play and prevented them converting some of the chances they were creating. Mikel prompted play with some driving forward runs from midfield, a position that he occupies for Nigeria rather than his limited role with Chelsea. Musa continued his trend at this tournament of shooting yet failing to hit the target. In the second half when Spain did increase the tempo once more, Torres scored his fifth goal of the tournament following fine play by David Silva moving laterally across the pitch and opening up space for Pedro to whip in a first time cross. The Nigerians still created and squandered chances with Gambo failing to convert the best opportunity in the 74th minute. The game ebbed away thereafter and Alba scored the most of the most unusual goals you may ever see in an international game. David Villa took a free kick in the left back area and found Alba, the most advanced Spanish player who was crossing the halfway line and who ran through on goal before rounding Enyeama. With no Xabi Alonso in the squad due to injury, del Bosque has now opted to play with just Sergio Busquets as the sole defensive midfielder in all three group games. The move away from the doble pivote system has been praised by some who criticised a system that has delivered a World Cup and a European Championship. Is del Bosque trialling a system for use when Spain combat more defensive opponents or will does he not trust a doble pivote of Busquets and Martinez? This has enabled him to field a midfield comprised of Busquets, Xavi and Iniesta in their normal positions releasing Iniesta from his wide left position with the national side and letting him flourish with driving runs forward from midfield as well as sharing the creative burden with Xavi. The mid level block that Nigeria used offered space in behind the defence and Spain attempted to utilise this with a more vertical approach at times. The movement of Alba, Pedro and Soldado provides options but this tactic needs to be considered more often. Soldado has being deployed as a true number 9 and supported by Fabregas who plays behind him and has the freedom to move across the pitch laterally as well as horizontally, and Pedro who comes in off the right wing to form a front two on occasion. 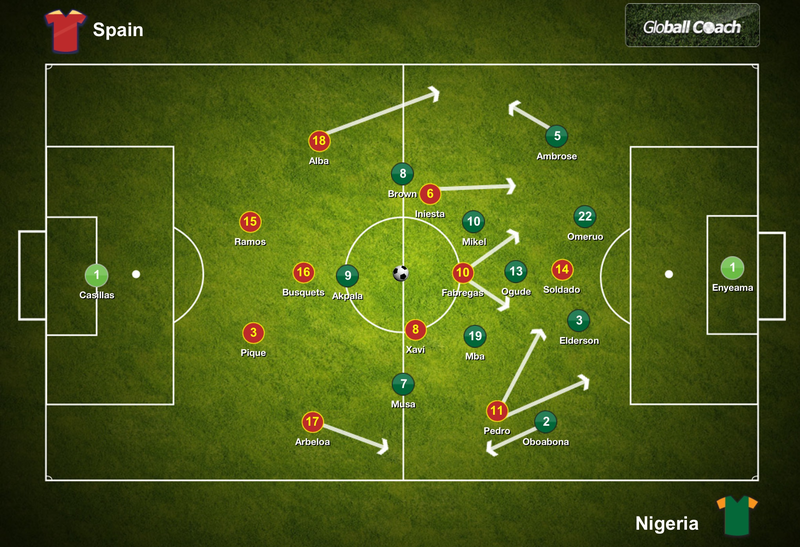 This system offers Spain tremendous fluidity in the attacking third but it also comes at a price. Whilst this may please some sections of the media with their consideration of what constitutes attacking play, this verticality weakens the control of Spain. Defence splitting passes are harder to execute successfully. With a risky pass the rewards may be potentially greater but so are the consequences. The opposition gets the ball back more often. With only one defensive midfielder, the defence has less cover. To ensure the defence is adequately protected, the side must press from the front and do so in a coordinated fashion. And in hot and humid temperatures, no team wants to be pressing hard. Nigeria arrived at the Confederations Cup less than 48 hours before their opening group game against Tahiti. Despite the 6-1 win over the minnows, the performance was nowhere near good enough. An improved performance but a defeat followed against Uruguay which left Keshi’s troops to produce what was arguably their best performance of their tournament against Spain. The current African Cup of Nations holders tackled the game in the correct manner with a mid level block that affords space behind the defensive line but it’s a risk worth taking to keep the defensive and midfield lines tight together. The compact unit becomes harder to play through and combined with Spain’s general malaise, Nigeria coped relatively well. Their late arrival due to a World Cup qualifier may not have been ideal preparation but the inclusion of so many young Nigerian based players. You have to wonder if the Super Eagles could have claimed a better result against Uruguay had their preparation for this tournament not coincided with such a vital fixture. Another factor which will surely influence games next year and which has had a noticeable effect on players has been the heat and humidity in some stadiums compared to others. Over such a large country with differing climatic conditions, players may need to adjust quite quickly to searing temperatures for fixtures. Acclimatising to such conditions will surely be at the forefront of many national teams who may want to arrive a little earlier than usual next summer. A semi final against the Azzuri awaits Spain in Fortaleza in a few days time. The focus will be upon the Italians and how they can eliminate the psychological scars from their 4-0 defeat to Spain in the European Championship final just one year ago. A viewpoint that conveniently erases the 1-1 draw during the group phase of the same tournament. Will Spain continue with the more attacking gameplan or will a fixture against a more tactically astute opponent with players who can execute that plan lead to an alteration in the Spanish system? The Italians will not arrive in Fortaleza with any inferiority complex. If Spain don’t lift their performance levels on Thursday evening, the Confederations Cup will once again slip from within their grasp as it did in South Africa four years ago.